Select the Registration link to the left on this page to get your athlete ready for the 2019 season. Refunds will not be issued after July 26th for any reason. If you athlete needs to withdraw from the program you must email northpauldingfootball@gmail.com prior to the end of day July 26th 2019. We will be holding a Raffle on May 10th. Coach will be giving raffle tickets to all the players that have raised money during Lift-a-Thon and through Discount Card sales. For every $100 raised the player will receive one raffle ticket. Our updated 2019 sponsorship program has been finalized! North Paulding Football relies on our partner sponsors to provide safety and training equipment to our student athletes. These sponsors are critical to our programs success. Visit the Sponsor page to see all the great companies that contribute to our community. Your support of these businesses will help ensure they're continued support of our student athletes. 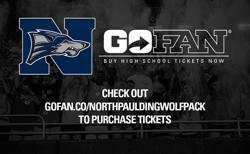 If you were unable to attend the Player Parent meeting on February 13th, you may be missing out on key information that will impact your athletes ability to participate in North Paulding Football. Below, please find the presentation from that meeting and review the details with your athlete and family. As Coach reminds our athletes daily, "If you want to EAT on Friday, you have to work Monday through Thursday." Purchase Parking, Dinner on the Deck, Den Seats, Sponsorships etc. If you hit the cone at all you were penalized five seconds… Attention to detail is why we will win or lose games! ©2019 North Paulding Football / SportsEngine. All Rights Reserved.